I mentioned that my 5 year old has fallen for the wonderful stories of Roald Dahl. Although we were reading James and the Giant Peach (which I was really enjoying) he decided we had to stop and read The Twits instead. So, we’ve been reading a couple of chapters each evening and taking a lot of pleasure in it, so much that it inspired a fun baking session. 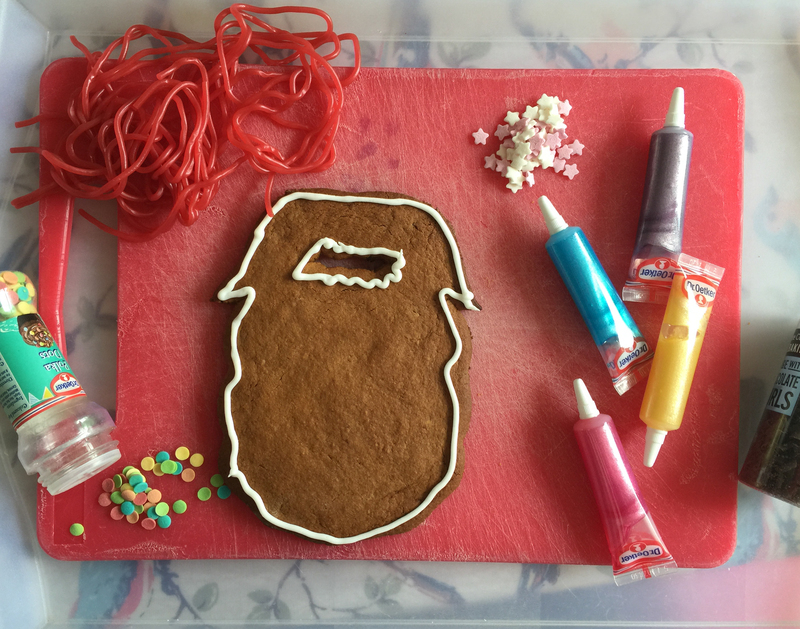 Yes, we baked a beard in honour of Mr Twit, decorated it – then ate it! We had so much fun we thought we’d share our Twits-inspired activity. Mr Twit is famous for his horrible beard, which he never washes and is filled with bits of old food. 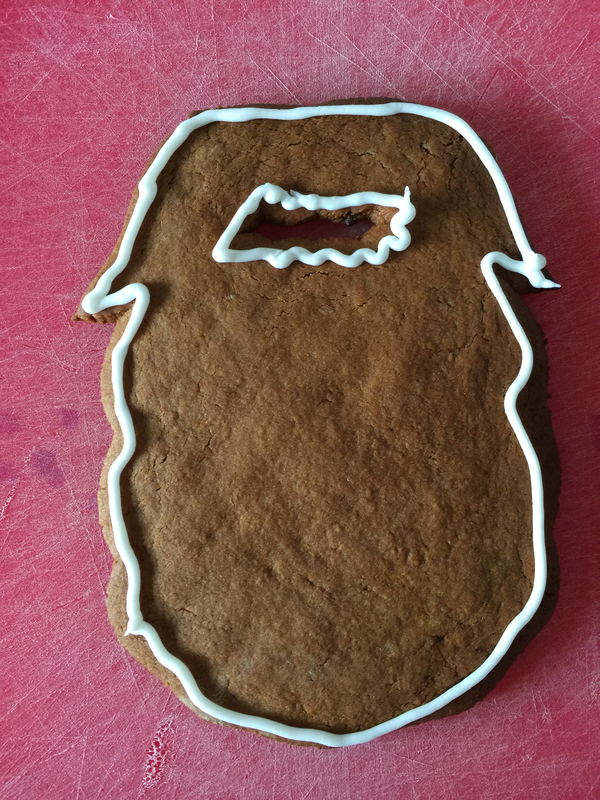 To make our own version we first drew a good beard shape then used it as a template to cut out an amazing gingerbread beard (I used my never-fail gingerbread recipe here). After it had been baked and turned a delicious golden brown colour we left them to cool down. I piped around the edge with white icing. I’m not quite sure why I did that but it seemed like a good idea at the time. Then we set up each gingerbeard biscuit on a tray along with an assortment of icing pens, strawberry laces, sprinkles and sweets. 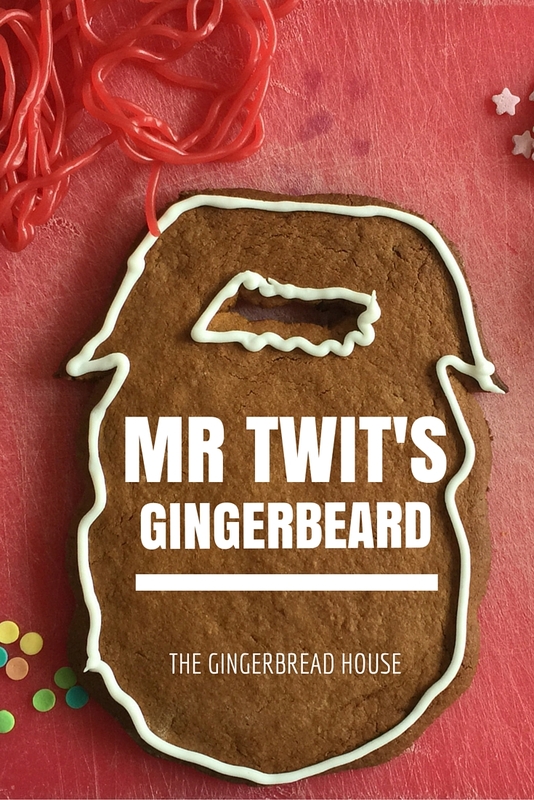 The idea was to re-create Mr Twits disgusting beard with our own gingerbread and sweetie version. 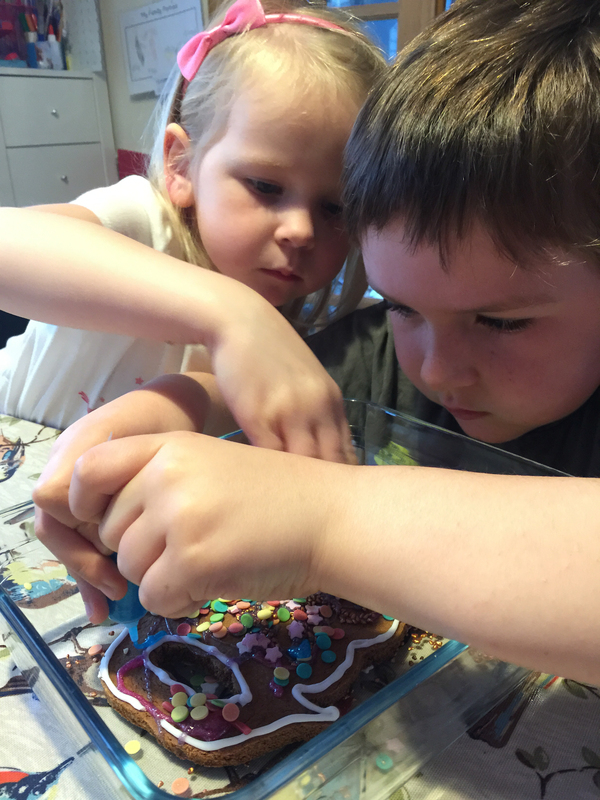 The children had fun cramming as many things on to their gingerbeards as possible. The room was very quiet as they concentrated on their biscuits. At one point the gingerbeards looked ok, but they were quickly covered in a colourful, sticky mess! Delicious! Of course when they had run out of the sweets and icing it was time for the gingerbeard test. Could they hold their beards up for a photo without everything falling off? Luckily both gingerbeards passed the test and there was a quick photo before they were able to eat their creations. 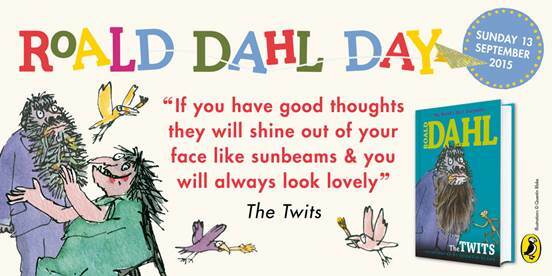 I hope you’ll agree this is a fun way to celebrate Roald Dahl Day this Sunday 13th September! Wow, I haven’t heard about the twits in a long, long time! I remember reading that at school! Oh wow these are amazing – I love Roald Dahl books and can’t wait for Boo to start reading them when she is a bit older. This is a great way to bring the book to life! This is brilliant! The twits was one of my daughters favourite books when she was younger. What a fab idea! So much fun… Would it be ok to add this to my roald dahl round up please? Oh my word, I love these! I love Roald Dahl, and the Twits is a favourite of ours too. It’s so lovely to be able to recreate a bit of the book in this way! I have no idea who Mr Twits is 🙁 I feel left out haha. They came out really good though. This is fab! Fun and tasty! I love Roald Dahl! Ooh I love this, it looks like you had an awesome time! Wow, Roald Dahl’s stories are totally wonderful, although I don’t remember much about the Twits. I love this gingerbread beard. I love this idea! 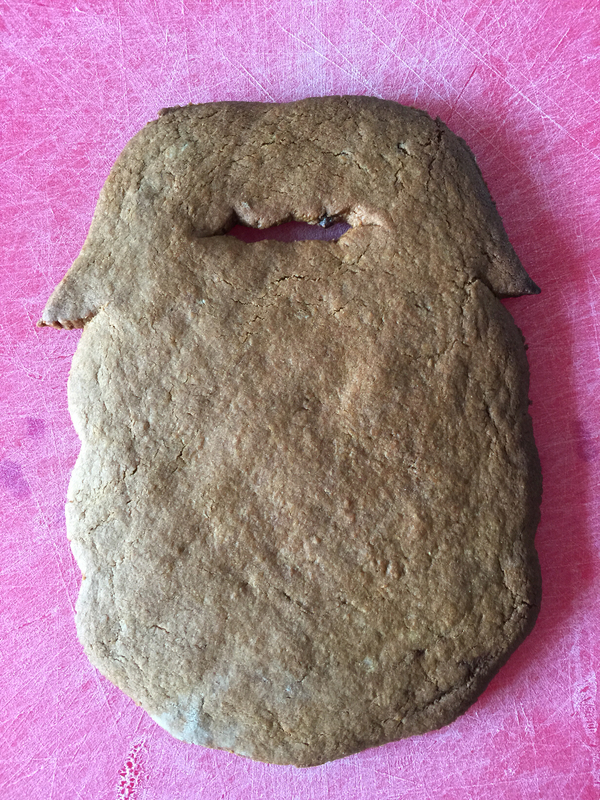 The Mr Twit biscuit certainly looks delicious! we love Roald Dahl too! What a fabulous beardy biscuit!